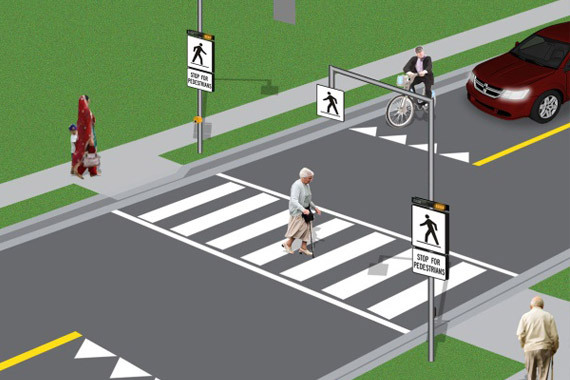 A pedestrian crossover is a new type of crossing where drivers and cyclists are required to stop for pedestrians intending to cross the road. Drivers and cyclists must allow pedestrians to cross the full width of the road before proceeding. Pedestrian crossovers are marked by signs and pavement markings. In some cases, they may also have pedestrian-activated flashing lights. It is the responsibility of drivers, cyclists and pedestrians to understand and follow the rules of the road. When crossing, follow rules for pedestrians; dismount and walk your bike. Learn more about safe cycling. What are the penalties for not obeying the rules? If drivers and cyclists do not yield to pedestrians at a crossover, they may face a fine in the range of $150 to $500. Drivers may also face three demerit points. The town's first pedestrian crossover was implemented in January 2017 at Navy Street and Church Street (Type B). 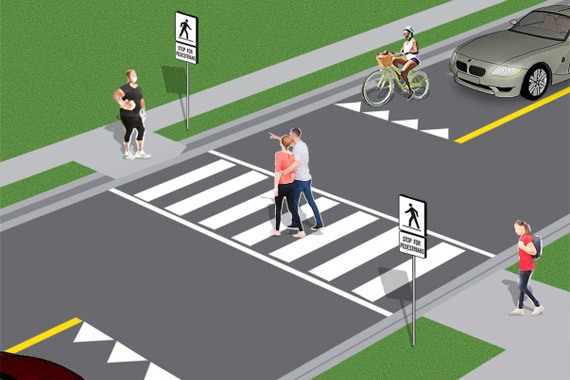 The recently completed Pedestrian Safety Program has recommended over 170 pedestrian crossover locations throughout the town that will be implemented over the next 10-15 years. What is the law around pedestrian crossovers? 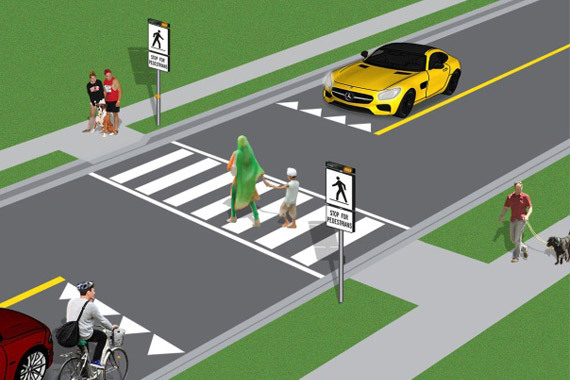 Drivers and cyclists must stop and yield the whole width of a roadway at pedestrian crossovers as well as at school crossings, and other locations where there is a crossing guard. Drivers and cyclists can proceed only when pedestrians and school crossing guards have safely crossed to the other side of the roadway. Why did the province make this change? The new law responds to recommendations related to pedestrian safety in the 2012 Chief Coroner’s Report on Pedestrian Deaths. Numerous requests were also made from municipalities and safety organizations. The new law is intended to protect the most vulnerable road users: school children, pedestrians and school crossing guards. Any location where a school crossing guard is present.